Corta Helio, one of the five family corporations that rule the Moon, has fallen. Its riches are divided up among its many enemies, its survivors scattered. Eighteen months have passed . The remaining Helio children, Lucasinho and Luna, are under the protection of the powerful Asamoahs, while Robson, still reeling from witnessing his parent's violent deaths, is now a ward--virtually a hostage-- of Mackenzie Metals. And the last appointed heir, Lucas, has vanished of the surface of the moon. Only Lady Sun, dowager of Taiyang, suspects that Lucas Corta is not dead, and more to the point-that he is still a major player in the game. After all, Lucas always was the Schemer, and even in death, he would go to any lengths to take back everything and build a new Corta Helio, more powerful than before. But Corta Helio needs allies, and to find them, the fleeing son undertakes an audacious, impossible journey--to Earth. In an unstable lunar environment, the shifting loyalties and political machinations of each family reach the zenith of their most fertile plots as outright war erupts. Luna: Wolf Moon continues Ian McDonald's saga of the Five Dragons. Ian McDonald was born in Manchester in 1960. His family moved to Northern Ireland in 1965. He now lives in Belfast and works in TV production. 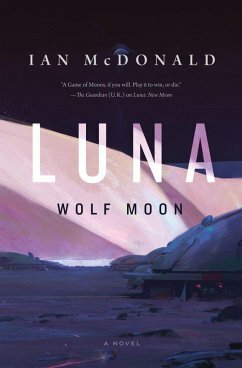 The author of many previous novels, including the groundbreaking Chaga books set in Africa, Ian McDonald has long been at the cutting edge of SF. RIVER OF GODS won the BSFA award in 2005, BRASYL won in it in 2007 and THE DERVISH HOUSE in 2010.